The Intertaional Toy Fair in New York begins Saturday, but this is when companies start dropping their big news, and today we’ve had a couple of bombshells so far. 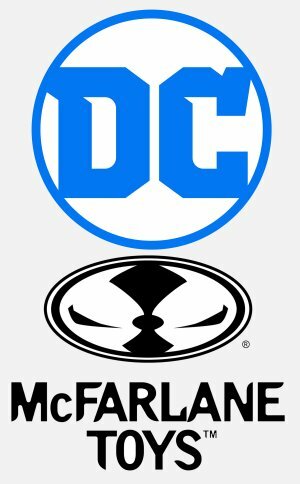 IGN reports that McFarlane Toys has been granted the license to produce collectible action figures from six to twelve inches tall, based on DC Comics comics, movies and television shows, along with corresponding vehicles and accessories. The report uses the term “Multiverse,” which was the name used for Mattel’s collectible line of DC Comics figures. This deal begins in 2020, so we aren’t likely to see anything or know any details until next year’s Toy Fair, but it is an interesting move. This likely means that the Spin Master deal, which we told you about late last year, will likely only cover DC Comics action figures that are aimed at the kid’s market, like the Mattel True Moves 12″ figures, or the upcoming Batman Knight Missions and Justice League lines from Mattel. Many fans of the DC Multiverse line were wondering what the change of licenses meant, and now it means that the license for DC Comics action figures has been split between two companies. Most likely, the Spin Master figures will sell for ten dollars or less, while the McFarlane Toys figures will sell for twenty bucks and up. This is a real surprise since Todd McFarlane, who owns McFarlane Toys, is one of the founders of Image Comics, one of DC’s competitors. Before creating Spawn, and co-founding Image, McFarlane drew comics for DC and Marvel, notably Spider-man and The Hulk for Marvel, but also Batman, Invasion and Infinity Inc. for DC. It will be interesting to see if McFarlane expands his toy company to handle the extra business, or if he cuts loose some of his other toy licenses, like The Walking Dead and Call of Duty. In retrospect, it may not be that big a surprise. McFarlane handles Game of Thrones, and just scored the license for Harry Potter and Wizarding World, and both of those are adminstered by Warner Brothers Consumer Products, who also run DC Comics’ licensing business. So this may have been in the cards. At Toy Fair, McFarlane will be showing off his newly-acquired licenses for Game of Thrones and Fortnite among others. The DC Comics license does not start until 2020. This is a bit of a surprise, but not really a shock, since the two companies are compatible, and Gentle Giant was dependent on Diamond Select for much of their distribution anyway. We’ll have more pre-Toy Fair news all week.